Ra.One a sci-fi superhero film which will have Shahrukh Khan playing the role of a superhero called G.One while the villain on whose name the film is named after is being played by Arjun Rampal. 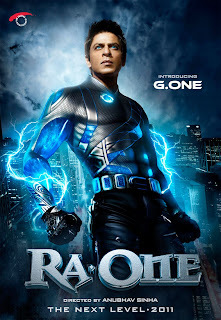 Ra.One apparently the most expensive Hindi film ever is also Shahrukh Khan's most ambitious film yet which he says aims to push the boundaries of the Special Effects in India which can be compared to the best in the world. The Special Effects in the film are also by Shahrukh Khan's own Visual Effects company called Red Chillies VFX along with the technicians from Hollywood. The ambitiousness of the film is clear from the fact that the film's promotion kick-started in March when the film's teaser trailer was unveiled during the Cricket World Cup which was later followed by a longer trailer which was launched in May end. The film also features a song by the famous international rap singer Akon. It is set to release on Diwali this year with the highest number of screens ever for a Hindi film.